Innovative Integration, a trusted supplier of signal processing and data acquisition hardware and software solutions, has expanded its presence into the PXI/Instrumentation market with the addition of the PXIe-XMC Adapter. 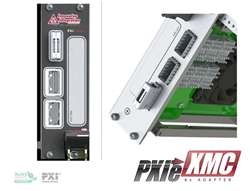 The PXIe XMC adapter can be utilized with all Innovative XMC cards including our newest generation models which provide 5 GHz analog I/O and use the Kintex XCKU060/XCKU085 UltraScale FPGA. This allows extremely rapid configuration of wide-channel count FPGA -accelerated wireless communications, RADAR, LIDAR and real-time control applications, spring-boarding the development of Medical Imaging, IP Development, High Speed Data Recording and Playback, Wireless Receiver, WLAN, WCDMA and WiMAX front-ends and turnkey systems. The adapter supports bulk PCIe x8 communications between the PXIe host controller and XMC modules (up to 7800 MB/s, sustained) concurrently with direct, ultra low-latency traffic between modules in a user-configurable topology at sustained rates up to 6300 MB/s. Innovative Integration is a subsidiary of Interconnect Systems, Inc. Innovative Integration is a data acquisition company that designs embedded boards, for digital signal processing, software defined radio and data acquisition with digital & analog interfaces which incorporates re configurable FPGAs that include the form factors of XMC, FMC, PCIe, PXIe, & VPX. Digital receiver instrumentation and embedded PCs are also included within our product portfolio. For more information on Innovative Integration please visit http://www.innovative-dsp.com. Innovative Integration is a registered trademark of Interconnect Systems, Inc. All other trademarks mentioned are the property of their respective owners.